Jang Keun Suk has proved himself Asia’s prince once again. Proving hallyu star’s contents power, Jang Keun Suk has released his third original full length Japanese album Monochrome. Monochrome, which was released on February 25, is an album that Jang Keun Suk released one year and nine months after he released second album Nature Boy. This album has been released to celebrate his fifth anniversary in Japan, containing the original album as well as a photobook, making of DVD and more. The title song Hidamari (translated as Sunny Spot) is a medium tempo love song with a warm and hopeful message featuring a beautiful melody. Since the album expresses the doubles sides of Jang Keun Suk, who shines on stage but at the same time has worries and uneasiness on the inside, the black and white photos also express his view of the world. The lyrics to all of the tracks in the Monochrome album has been written by Japanese lyricists, including Satomi, who wrote the lyrics to the song Snow Flower, and H.U.B, who worked on TVXQ and Crystal Kay’s songs. 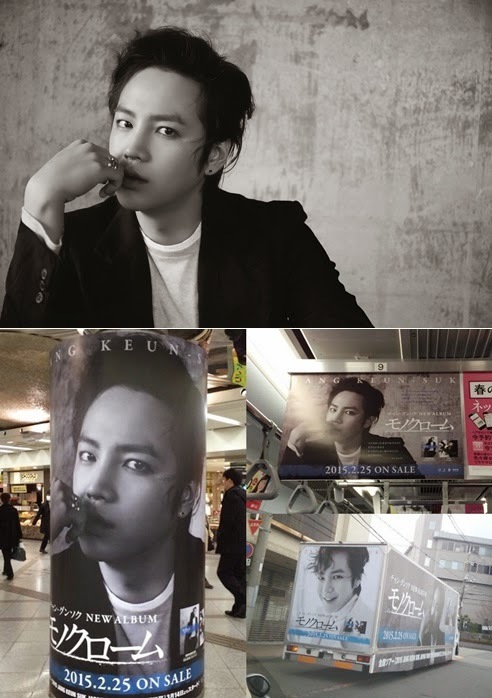 Jang Keun Suk will begin his Japan tour 2015 Jang Keun Suk the Cri Show on March 14 in Osaka. The upcoming tour will present 12 hall concerts in six cities and four arena concerts in two cities, for a total of 16 concerts and the tickets to the hall concerts have already been sold out.